Breast Cancer is the second leading cause of death in women around the world. This October, Glamulet has launched a campaign to push towards an incredible goal: Glamulet believed that by the year 2050 no woman should die from breast cancer. But they need your help to make this dream a reality. Glamulet is a Charm brand, launched in 2014, that offers women a new range of trendy and elegant quality jewelry at an affordable price. Glamulet believes that every woman should be allowed to express herself and to feel pretty, and they design glamorous Charms and bracelets with the use of quality materials to manufacture them. Each woman can mix and match the Charms to create her own Bracelet. Glamulet empowers women by giving them affordable accessories to state their fashion sense, commemorate an event or symbolize a special meaning. Today, Glamulet is working hard to spread this vision worldwide and to better the life of every woman. October is Breast Cancer Awareness Month. 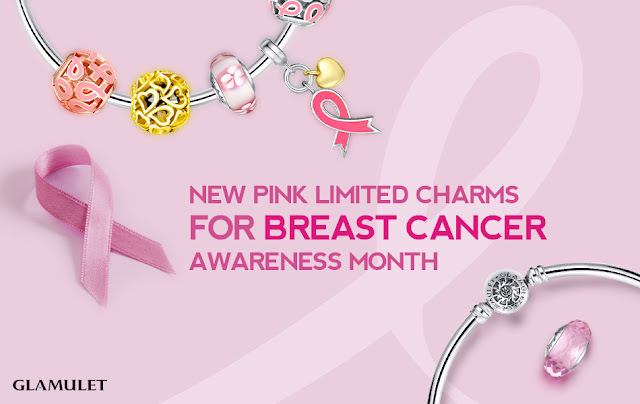 So this month Glamulet is offering special edition Pink Charms dedicated to this cause. 50% of all sales from these special Charms will be donated to charity. You can support the Glamulet Pink October cause by purchasing one of these limited edition and beautiful Charms anytime before the end of this October.